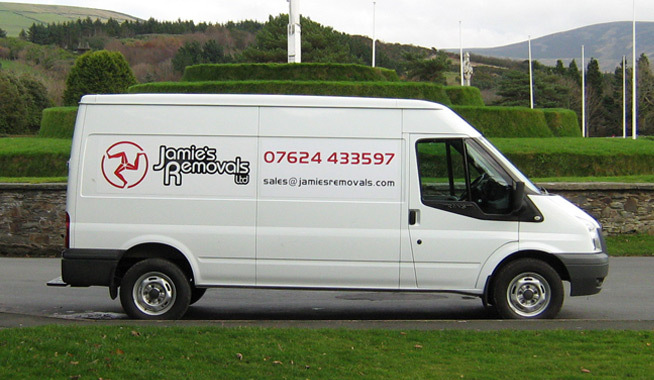 We offer a 'Man and Van' service for removals and rubbish disposal within the Isle of Man. We're available 24 hours, 7 days a week. So if you're looking for someone to move your belongings from a house or flat, or you simply need something picking up or dropping off, then give us a call on (07624) 433597. We can supply a Ford Transit 'long wheel base' van, a 'Luton' box van with tail-lift or a 7.5 ton box truck, with either one, two, three or more men. Our man and van service is usually chargeable at an hourly rate, so if you and your family and friends want to muck in to help keep the cost down, then you're more than welcome to do so. Our vans come with plenty of blankets and ties to protect your furniture. All bookings are covered by our goods in transit insurance. We can collect and deliver items anywhere on the island. We also offer transport of single items and part loads, to and from the UK. We can collect and dispose of clean household rubbish, such as fridges, washing machines, sofas and beds. We also remove shop and business waste, and carry out house clearances.